The Happiness Challenge, an online program aimed at increasing happiness and well-being on campus, begins Tuesday, March 1, and runs through Tuesday, April 26. It is open to any member of the Emory community, including students, faculty and staff. Created in 2012 by an undergraduate student at Harvard University, the challenge is now in its final year as a pilot program. In addition to Harvard and Emory, other participating universities this year include Yale, Stanford, UCLA and the Instituto Tecnológico Autónomo de México. Spearheading the program for Emory is Michelle Plavnik, a senior in Emory College who is majoring in chemistry and serves as an intern with Flourish Emory, a program within Emory's Office of Health Promotion. Increased happiness, higher levels of flourishing, reduced stress, more life satisfaction, more awareness and an increased sense of purpose and meaning are some of the expected outcomes of the program, Plavnik says. "The Happiness Challenge allows for individuals to take on a new challenge each week and focus on a task to improve their happiness and well-being in a variety of ways," says Kate Chiseri, health promotion specialist in the Office of Health Promotion. Each participating campus picks how many and which habits they want to include. The habits are based off what are considered best practices in areas such as exercise, sleep, thinking patterns, socializing, relaxation, self-monitoring and more. Plavnik says those who join can follow the program on their own time. However, she notes that each module will open on Tuesday and close on the following Monday. Describing the Happiness Challenge as an initiative for the entire Emory community, Chiseri says, "We have also added a little competition to the mix and allowed for the creation of teams. Being part of a team allows for increased encouragement and social support of your peers, while completing your own individual challenged. 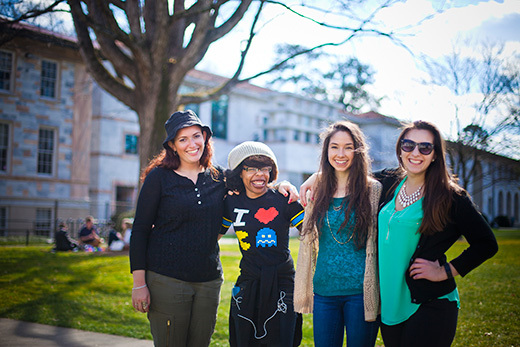 Teams can be research groups, residence hall floors, athletic teams or groups of friends." Chiseri notes that participants can join a team or choose to take on the challenge as an individual. "The Happiness Challenge provides great value to all students, faculty and staff," explains Des'mon Taylor, Harris Hall Complex director and coordinator of Flourish Harris, who is working with Plavnik on the program. "Some key values we teach in Residence Life are self-management, leadership and living a healthy lifestyle," Taylor says. "Our role is to help our students foster these healthy habits that they will take with them into the future." At the end of the eight weeks, participants who complete the entire challenge will by hosted at a dinner by Emory administrators. Plavnik says dinners for 10 to 12 participant finishers each will be hosted by Gary Hauk, vice president and deputy to the president; Claire Sterk, university provost and executive vice president of academic affairs; and Suzanne Onorato, Campus Life assistant vice president for community. "We are excited about the opportunity for students and faculty to engage in a more informal setting where they can talk about whatever they want to," says Chiseri. Andy M. Kazama, psychology instructor and research associate in the Division of Developmental Cognitive Neuroscience in Yerkes National Primate Research Center, made a Happiness Challenge video at the request of the students and staff at Flourish Emory that is posted on the Emory Happiness Challenge Facebook page. "Diversity is hugely important for creating a vibrant campus, and I think we all benefit by taking a moment to share our unique road to happiness with others," says Kazama. "The message of my Happiness Challenge video is that my personal happiness comes from knowing that I am on my life path — teaching and conducting research with an amazing team." For more information and to register, see the Emory University page on the Happiness Challenge website.